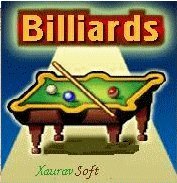 Billiards for Blackberry | BlackBerry Blast! In this traditional game of billiards you must sink the 15 object balls into any of the 6 pockets. To do this, you must strike the white cue ball with the cue stick. You can play alone, compete against a friend (Duel), or compete against a computer opponent.